One of the things I’m good at is following instructions, i.e. engaging in a prescribed activity. Tell me to find a feather, throw it as far as you can (Ozeki Prompt #7), and I’ll do it. Suggest that, while in a library, I write a sincere note of apology, to someone…and fold it up and leave it in a library book…(Ozeki Prompt 9) and I’m enchanted, spurred to action. But neither of these learning experiences begin with an “F,” so on the sixth day of the A-Z Challenge, I’m submitting a few excuses to illustrate why I’m fulfilling Prompt #20 in a minimal way. I’m on vacation in my home town, Visalia, California, having fun with two friends I met in high school sixty years ago when we were thirteen year-old freshmen. Marylin lives in Visalia, Sandra’s home is in San Francisco, and I’m based in Bellingham. Instead of working on today’s blog, I spent several hours in the library of my childhood combing through digital files about my great grandfather, a civil war veteran. He’s the subject of tomorrow’s “G” blog. I appreciate the latitude in Ruth Ozeki’s prompts to not follow instructions. I’m good at following the type of instructions you find with new household appliances! I think it’s because I have a logical mind and love reading. Those written instructions hold no fears for me. However, I can quite easily get side-tracked so I quite understand why you haven’t done much with your blog today – far more pressing engagements! You’ve given me an idea for the letter I in the A to Z, which I haven’t written yet. Thank you! Hi, Thanks for your comments. I’ll look forward to your blog posts since I’ve spent and still spend quite a bit of time around the kitchen table. I might have to follow Ruth’s advice as well. 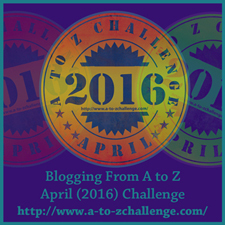 I’m a day behind on my A to Z challenge, looking at having to complete both F and G today. I tried in the wee hours and couldn’t keep my eyes open. Your dedication to this abcderian adventure is inspiring! Well, and here I am again, trying to work on G before I, happily, meet AMP’s airplane. G’luck to you! On a side-note: It’s amazing that you’ve been friends for 60 years! ! Hurray for you–dedicated discipline AND spontaneity!